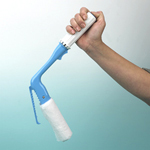 This toilet tissue aid is a simple solution for people who need an extended reach. 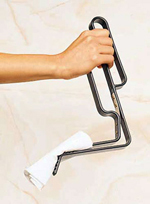 The spring clamp on this toilet tissue holder easily opens to release tissue paper. This handy toileting aid measures 10 inches long. 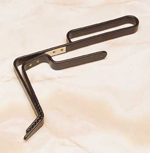 The vertical handle and horizontal clamp both measure 6 inches long. 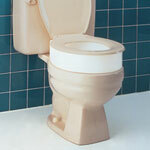 This bathroom aid is ideal for persons who are disabled, obese or are small people(dwarfism). Use with No Rinse Peri-Wash for added personal hygiene.